Tired of having to remember what the DC of you 5 level spell is? Tired of have to remember the amount of 7th level spells you have for the day? Tired of having to remember what spells are in your domain? Now you don't have to. With Character Props: Player Spell Book you can create your own customized spell list of all the magic spells listed in the SRD at your finger tips. And best of all you can print them out and only use the ones you need, without flipping back and forth through a tone of books. 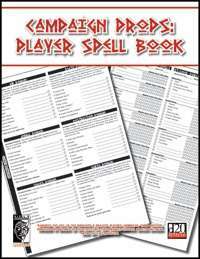 Also included with this PDF are blank Spell List and Domain Pages so you can key in you own specific spell lists. This 26 page PDF is just the sort of thing needed for Players need to have.